I am super excited to have the opportunity to share with you about this 100% Pure product (See below for short brand description). Alright, so I know what you’re thinking “$29 for a lipstick? Why?” Yes, this is a pricier lipstick… but let’s find out if it is worth the purchase. When I first swatched this, I noticed how pigmented corally pink and bright it was. Not my usual go to shade, definitely out of my comfort zone, none the less it is super pretty. There isn’t a strong scent to it, I really had to search for the scent to find that it has a suuuupper faint fruity scent (This lipstick is fruit dyed, so it made sense). This lipstick is described as a “Cocoa Butter Semi Matte Lipstick,” and honestly when I apply it on, it looks matte. Like as if I had a matte liquid lipstick on, except these are more like a lip stain type finish (As far as the application, it is very smooth and easy. However this lipstick does not glide on with a creamy feel; which is probably due to the fact that it’s more of a more true matte type lipstick). This lasts practically all day! Crazy right? Most traditional type lipsticks in this form usually transfer with ease and need a few reapplications throughout the day. 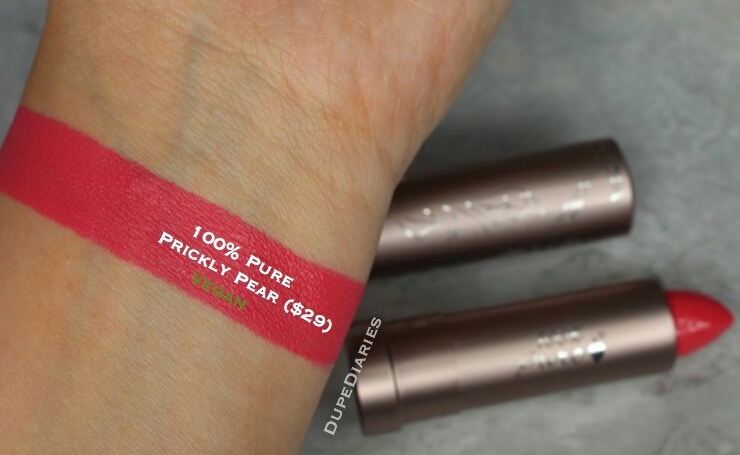 “Pickly Pear” does transfer super easily, but it has solo much pigmentation that it really doesn’t look like the lips lost much product. When the product does transfer “all” off, it leaves a stain on the lips so it’s like you’re still wearing lipstick (Note: if you plan on kissing someone, just know it may stain their skin. The swatch I did up above did stain my wrist for a day; which I think is really the only big downfall). So are these worth purchasing? Yes. Now I know it is a more pricey lipstick, but if you find a color you really enjoy it”ll be really worth it. 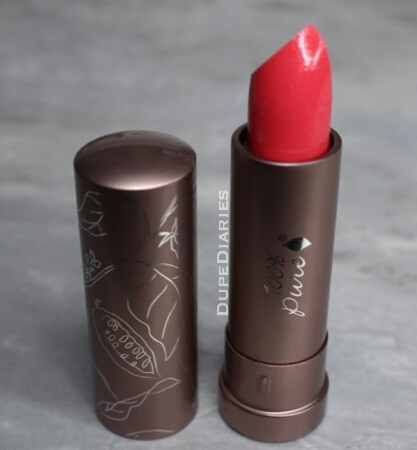 When you take in to account how this lipstick is formulated, it really isn’t too bad because not many lipsticks are made with such benefits and lack of toxins, artificial colors, etc.